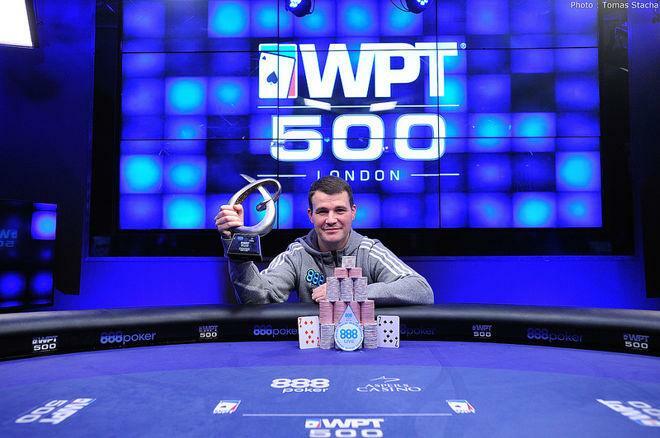 Gary Miller is £114,000 richer and a World Poker Tour champion after winning the WPT500 London Main Event. Gary Miller became a World Poker Tour champion this weekend when he emerged victorious in the $1 million guaranteed WPT500 London at Aspers Casino in Stratford, London. Aspers-run venues must be lucky for Miller because he’s enjoyed his fair share of success in them. Miller finished second in the partypoker WPT National Newcastle Main Event in Apr. 2015 for £14,000 and then banked £15,230 by finishing second in the 888Live Local at Aspers in London in Jul. 2016. Miller also walked away £8,430 richer in Dec. 2017 when he finished third in a £220 buy-in tournament at Aspers in London. Now Miller has his first six-figure score after winning WPT500 London for a cool £114,000. He started the final day, and therefore the nine-handed final table, as the tournament’s chip leader and in good shape to win the first-place prize. Everyone except Sunil Mistri received a pay-jump on the very first hand of the final table. With blinds at 60,000/120,000/20,000a, Mistri moved all-in for 1,095,000 with pocket tens and Sang Leung re-shoved from the button with ace-jack. Mistri’s hand remained the best right up to the river when the ace of clubs landed to eliminate him in ninth-place. Adrian Petrus became the eighth-place finisher during the 75,000/150,000/25,000a level. Petrus was all-in from the button for 755,000 chips with ace-three and it was Leung again who called to put him at risk. Leung called with pocket sevens, which held to reduce the player count by one. Seventh-place went to Kevin O’Donnell who had endured a torrid time at the table. After losing a coinfip with pocket queens against Leung’s ace-king, O’Donnell was left on fumes. O’Donnell was all in from the big blind with eight-five offsuit and saw three players limp into the pot. On a king-eight-six flop, Richard Hoadley bet 200,000 chips having flopped a set of eights and the other two players folded. The turn gave O’Donnell a glimmer of hope, but the queen of diamonds river sent him to the rail. Despite winning those chips, Hoadley was the next casualty of the final table. The action folded to Hoadley in the small blind and he moved all-in for a shade over eight big blinds with jack-nine. Miller was in the big blind with a pair of red aces staring back at him and he called. The aces held and Hoadley was eliminated. Leung’s rollercoaster ride ended in a fifth-place finish. After losing all but less than a big blind when she three-bet all-in with pocket threes and ran into Dwyane Bradley’s kings, Leung was all-in with queen-four of clubs against the king-queen of Miller. Leung did pick up a flush draw on the turn, but a queen on the river meant her four-kicker was no good and the final table became an all-male affair. A flop to end all flops claimed the tournament life of Charles Akadiri. Miller moved all-in from the small blind to put Akadiri to the test for his 10.5 big blind stack. Akadiri showed ace-nine to Miller’s ace-five of clubs and looked set for a timely double. That was until the flop fell two-three-four of clubs to gift Miller a straight flush! Game over for Akadiri. Third-place was decided soon after Akadiri’s dismissal and it was Bradley who was confirmed as the finisher in this position. Getnet Hailu opened to twice the big blind, or one 1,000,000 chips, with pocket aces and then had an easy call to make when Bradley moved all-in for 4,965,000 chips with what turned out to be jack-five of clubs. Hailu’s aces held despite Bradley picking up a flush draw and heads-up was set. Miller held a 15,460,000 to 11,805,000 chip advantage over Hailu and he never relinquished the lead. The final hand took place during the 300,000/600,000/75,000a level and saw Hailu open-shove for 3,400,000 with and Miller call with . Hailu went in front on the flop but the on the turn locked up the hand for Miller, meaning Hailu had to console himself with the £79,830 runner-up prize, the largest of his career. With this £114,000 score, Miller now has almost $250,000 in live tournament winnings and a bankroll boosted to such an amount that we are very likely to see him in some of the UK & Ireland’s biggest tournaments over the next 12 months and beyond.